Sorry for the lack of posts lately (gosh, really can't say that enough). You can thank my social studies teacher for that. And, HEY, if any of you feel like throwing on a disguise and coming to class to take my 200 point Revolutionary War test for me too, you are more than welcome! Anyways, I'm finally doing Fashion Week coverage. 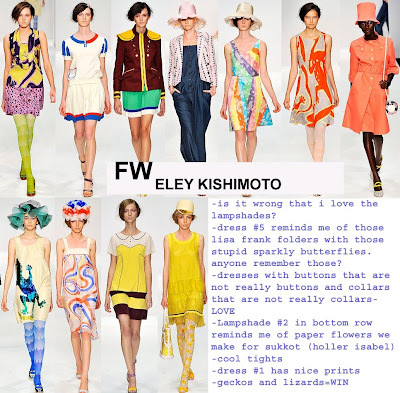 I liked the obvious ones, like Christopher Kane and Luella, but when I came across these designers I'd never heard of I thought I'd post. As for the editing skills, bear with me, I am still trying to figure out photoshop. I'm not totally obsessed with any of these like I was with other collections I saw (more posts later), in all of them there are a few looks I love and the rest are sort of "eh", as indicated by my captions. What do you think? Also, I know you are all as tired of me babbling on about Belle as you are of the lace trend, but she entered a contest over at Queen Gilda and seriously deserves to win. Best dance moves and MC Hammer impression ever, hands down. So as you're getting on your Groucho Marx glasses and brushing up on the Battle of Bunker Hill for me, please head on over and leave a comment for Belle!